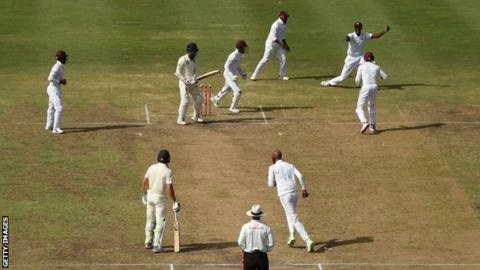 England subsided to a 381-run defeat against West Indies as part-time off-spinner Roston Chase took 8-60 on day four to win the first Test in Barbados. Needing to bat out the final two days for a draw, or score an improbable 628 to win, the tourists were bowled out for 246 in the evening session. England made a positive start, reaching 134-1 before Rory Burns was dismissed for 84 on the stroke of lunch. The England batsmen then fell to a series of poor shots. Unlike the first innings when England were skittled for 77, all of the top order made starts but they all failed to go on to make a score that would have at least taken the game into the final day. The defeat is England’s joint seventh-heaviest in terms of runs in Tests and sees them fall 1-0 down in the three-match series with the second Test beginning in Antigua on Thursday. After a brilliant display in the first innings, the main threat was supposed to come from West Indies’ fast bowlers. Instead, Chase, who averaged 47 with the ball before the match, went on to claim the best figures by a West Indies spinner against England. He was, however, given significant help by the tourists’ batsmen who repeatedly gifted him wickets on a pitch that offered little spin. Opener Burns batted well for his highest Test score but he missed a straight delivery on the final ball of the morning session and was bowled. After lunch, captain Joe Root flicked a short ball by the off-spinner to slip for 22, Ben Stokes missed another ball that did not spin and was out lbw for 34 and Moeen Ali guided a wide, short delivery to slip. Moeen’s tame dismissal left England 217-6 at tea and they lasted just another 10 overs in the final session with Chase taking all four wickets. Jos Buttler chipped the ball to mid-wicket for 22 to give the part-timer his fifth wicket, Ben Foakes was perhaps unfortunate to hit a powerful sweep straight to short leg before Adil Rashid hit the ball in the air straight to the fielder on the mid-wicket boundary. Chase fittingly claimed the final wicket with Sam Curran stumped down the leg side when trying to smash runs in the losing situation. In the first innings England could argue West Indies claimed wickets thanks to good bowling, but the same cannot be said about their showing on day four. There were positives; the runs for Burns at the top of the order that should secure his place at the top of the order for the time being and the fact they batted for the majority of the day. But the manner of the second-innings dismissals will surely disappoint, even if they were always likely to lose after being bowled out for 77. As well as the gifting of wickets to Chase, opener Keaton Jennings was again out in familiar fashion, edging a full delivery from a pace bowler to slip when driving for 14. Little went right for England in the game since deciding to leave out Stuart Broad, instead preferring Rashid as a second spinner and Curran as the new-ball bowler, both of whom were ineffective. England’s first-innings showing was their third alarming collapse in the last 12 months, following on from being bowled out in a session by both New Zealand and India in 2018. The loss brings to an end their recent good run that has seen them beat India at home and win 3-0 in Sri Lanka for the first time, but they have little option for wholesale changes to the batting with uncapped 32-year-old Joe Denly the only spare batsman in the squad.